Like last Tuesday night’s Berkeley City Council meeting, tonight’s debauchery should be just as entertaining. On the agenda to be discussed: mutual aid and nuclear power plants. The main reason the Clog is going though is because we hope that amid fierce debates of mutual aid, we’ll hear some talk of Berkeley PD’s newly acquired toy, the armored truck. Is it a secretly a Transformer? Will people protest reinforced vehicles? We’re bringing our popcorn (no but for serious; if you see peeps munchin’ on buttery goodness, that’d be us) and live-tweetin’ the meeting. Follow along on the Daily Clog twitter, here! Now let’s get this show started. Oh-ho! What have we here? A holiday challenge, you say? Indeed– indeed we do. We’re not sure who the genius/artiste/giant nerd behind What Did You Do to My Shoes is, but, by golly, we think he’s got something that will tickle even the most spatially retarded Berkeley-based intellect. 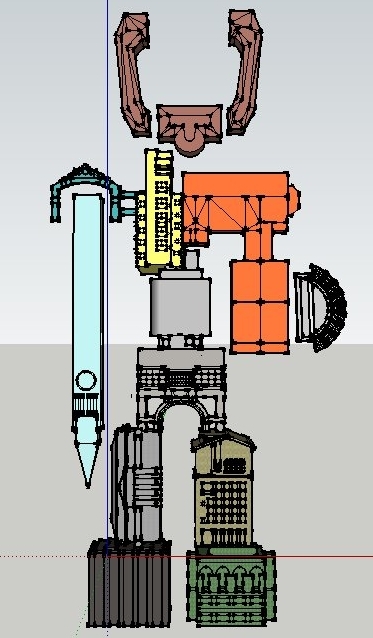 At right, friends, is a robot comprised of 12 campus structures, who’s ready to gore you with the Campanile. For reals. It will. Because it exists. P.S. The guy’s looking for a pun-tastic name for his robo-tastic creation. Got any good ones? 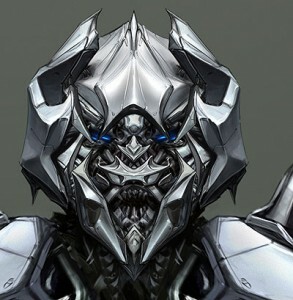 We’d offer Oskimus Prime, but we fully recognize how absolutely terrible it is.